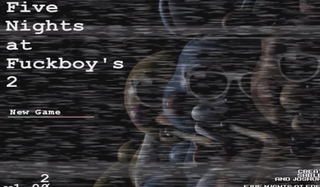 It's hard to describe Five Nights at Fuckyboy's 2. It's not what you would call "good," in the same way that 420BLAZEIT isn't exactly "good." But they are both hilarious and weird. The game takes the characters from Five Nights at Freddys, and puts them in a JRPG game where you battle party favors and listen to bizarre jokes that are reminiscent of Tumblr and montage culture. It's not really safe for work. Or life. Listen, I could keep trying to describe this game, which was made by Tumblr user Sable Lynn, but I'm just going to show you some screenshots instead. Words can't really do it justice. And you can download it here. Honestly? I think I like this ridiculous take on Five Nights better than the actual game.